Last week, we held our first event with Our House Atlanta! After a great month spent at the Decatur location, we couldn’t have been more excited to meet the kids. The 14 preschoolers had tremendous amounts of energy and inventiveness. Our House strives to break the cycles of homelessness by working with families who have babies and young children and are experiencing or facing homelessness. They have a shelter program, plus work with a whole systems approach to provide housing assistance, job training, and counseling, as well as quality daycare and preschool. Artist Nikita Raper taught the kids how to make “luminaries,” which are clay lanterns they will be able to place candles inside. Nikita arranged for their work to be kiln fired, so the kids get to have their creations professionally finished. First, our volunteers helped the kids cut out rectangles from slabs of clay. Then they each got to pick out cookie cutters to add fun shapes to their luminaries. They also used tools to decorate the clay with polka dots, drawings, and textures. Once the designs were ready, Nikita taught the kids how to slip and score! Scoring means scratching the parts of the clay that will connect to make them more adhesive. We used plastic forks for this step. Slip is the wet, sticky, clay version of glue - a substance painted on top of the scored area. The kids got a kick out of learning this new skill, and getting their hands dirty with the messy slip! 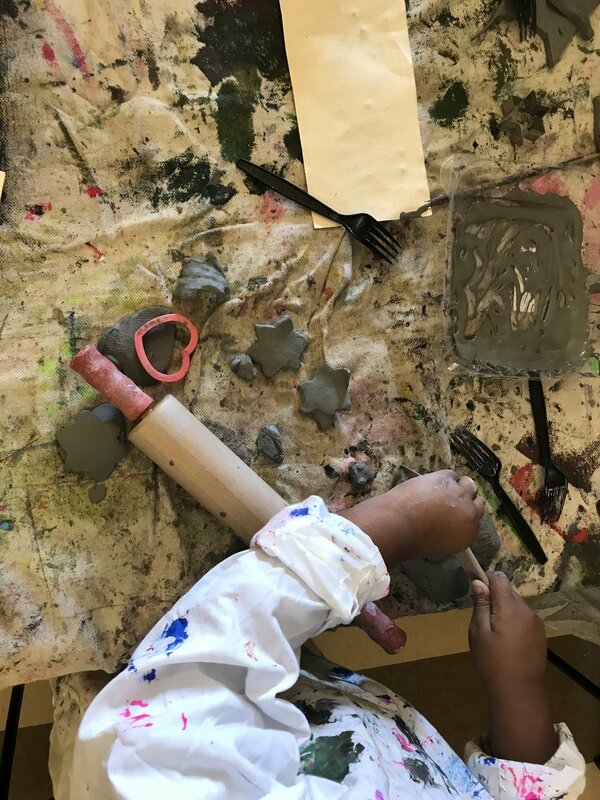 After slipping and scoring the edges of their rectangles, volunteers lead the kids through the process of wrapping their slabs into cylinders and connecting them to a base piece of clay. They pinched the ends of the newly formed shapes to secure them and set them aside to wait for the next step. While volunteers made some final touches to make sure the pieces were secure, kids got ready to glaze! They picked yellow, orange, or green, but all the glazes look brown before being fired. After painting their pieces, it’ll be so exciting for the kids to see the vibrant colors they turn out to be. Nikita lead this project with her always wonderful enthusiasm and brilliance, and our volunteers were key in keeping the day on track. The kids did an amazing job with this multi-faceted project, and we can’t wait to see what they create throughout the rest of the month. Next week, we’ll return their lanterns to them - fired and ready to shine! On Friday, July 6th, the awesome Nikita Raper led our Camp Peace friends in making stylish, screen printed clay plates. 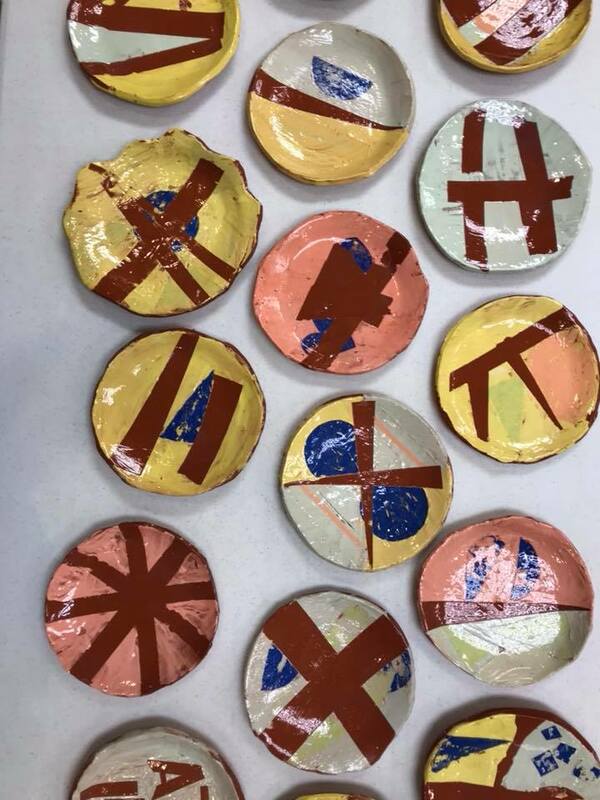 Each student had the pleasure of designing their plates with geometric shapes made of newsprint paper and polymer clay paint. Nikita even took the plates to her own studio where she glazed them and fired them in the kiln! We were so amazed at how beautiful they came out!! Our forty third event this year took place with a group of teenagers at Children's Healthcare of Atlanta at Scottish Rite! Our very own graphic designer Madison Beaulieu with the help of Paint Love volunteer Caitlin Martin taught them how to create several stop motion films! They created the one above as well as the video below filling in the blank for what "Art is _____," Their artwork was amazing and their answers were wonderful!